Regular service between our islands and Newfoundland! Who can resist the temptation to sail off and discover the cold, rugged beauty of our exceptional islands! Whether for purchasing tickets online or in-person at our points of sale, or for assistance, our devoted staff is ready to serve you. 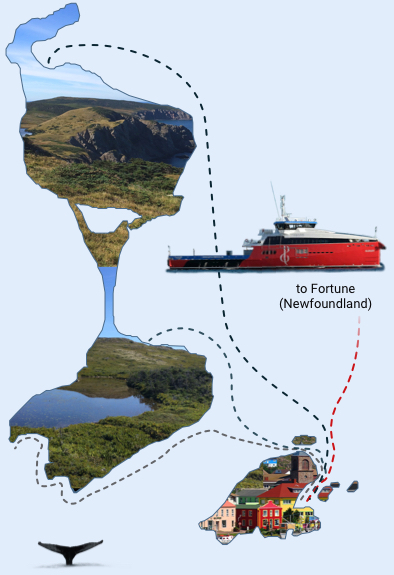 Daily crossings to Fortune (Newfoundland) and discovery tours of the coastline of the archipelago. An enchanting, charming, colorful region. Admiring our scenery will change you forever! Visit regularly to get the latest information and your trip is sure to be a success! After NORDET and SUROIT it is the turn of the JEUNE France which ensures the rotations between Saint-Pierre and Langlade to make its obligatory annual refit.The ship climbed this morning, Tuesday, April 2, on the Saint-Pierre slipway.Langlade rotations is scheduled for the end of April. The vessel “SUROIT” returned yesterday, Sunday, March 31, from its annual refit. It will make its rotations in the week.Each ship returned to its maximum passenger capacity of 188. The new ferries have arrived ! On November 28th, the two new ferries owned by the Collectivité arrived by the Atlantic Winter. On December 1st, the two vessels named “Nordet” and “Suroît” were launched. The commissioning phase is scheduled for the second half of January 2018. The car shipping services will operate in June 2018.